Cordillera Administrative Region is surrounded by mountains. Cordillera Administrative Region or CAR as it is referred to is a completely landlocked region in the central mountains of Northern Luzon. The region is located on and around the Cordillera Mountain ranges, which are the largest in the Philippines. The Cordillera Administrative Region boasts the second highest mountain in the Philippines, Mt Pulag and the Banaue Rice Terraces, one of the man made wonders of the world. 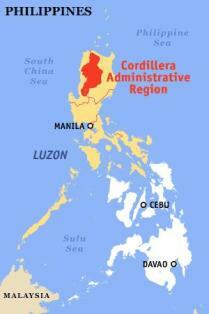 The Cordillera Administrative Region is divided into six provinces. The main city in the Cordillera Autonomous Region is Baguio City, the summer capital of the Philippines. Traveling to Baguio City will take you about 35 minutes by plane and 6 hours by bus both from Manila. Abra Province is one of the land locked provinces which make up the CAR. To the north of Abra lies the province of Ilocos Norte. On the opposite end, to the south of Abra are the two provinces of Ilocos Sur and Mountain Province. On the eastern boundary are the CAR provinces of Kalinga and Apayao and shares the western boundary with Ilocos Sur. What to do in Abra? Abra province is wedged between the Cordillera mountain range and the Ilocos ranges and is an extremely rugged and tough countryside, it has a number of rivers that start in the mountains of Abra and run through the province. Abra is rich in both natural and historic sites. Don’t miss the historical legacy left by the Spaniards in most of the small municipalities, the old Roman catholic churches. The province boast numerous rivers carving there niche in the valleys throughout Abra. For swimming you cannot go past the provinces longest river, the Abra River. Not to be missed is the Libtec Underground River in Barangay Libtec, Dolores. It is quite an eerie sight looking over the river to watch it disappear into a cave leaving a background of fields and paddocks. There is a fair amount of legend and superstition surrounding this great photographic opportunity. The province of Abra can be reached from Manila by bus. The trip through the mountains can be alarming and spectacular, all part of your journey! Apayao Province is the most northerly province in the Cordillera Administrative Region. It shares boundaries with Cagayan Province to the north and east. Ilocos Norte and Abra provinces lie on the western boundary. On the southern boundary lies the province of Kalinga. Apayao Province is rather remote, but for those who make the effort will be rewarded with some beautiful natural wonders. The province’s economy revolves around agriculture as most of the Cordillera Administrative Regions do. If you love waterfalls and quiet crystal clear waters, then you will not be disappointed with what you will see here. Make sure you have a camera because there is a photo opportunity around every corner. Do visit the ruins of the old Spanish Churches. They stand as a reminder of the Spanish friars failed attempt to convert the Isneg tribe of the Apayao. The only way to get to Apayao Province to by land transport. There is no commercial airport in Apayao Province. The two ways of getting to Apayao by land is either through Cagayan Province to the west or Mountain Province which is also to the west of Apayao Province. Benguet Province is surrounded by mountain ranges and other provinces. Benguet is the southern most province in the Cordillera Administrative Region. Its neighbor to the north is Mountain Province and to the south is Pangasinan Province. To the west Benguet shares boundaries with Ilocos Sur and La Union. To the east are the provinces of Nueva Viscaya and Ifugao. Wow talk about being surrounded. Benguet is the proud owner of the second largest mountain in the Philippines, Mount Pulag, which sits at just over 2,930 meters. Often shrouded in fist or fog, it is easy to understand why local folk law believed Mt Pulag was home to the Gods play area. Mt Pulag National Park strictly governs visitors, camping and tour guides. Small fees are payable for the use of Mt Pulag, which are put back into the care and maintenance of the National Park. This really is a tranquil and delightful area to visit. Not to be missed. Benguet Province also has scared burial sites, which are also worth a visit. There are numerous caves dotted around the province which have been used for centuries as burial sites, with the mummified remains still eerily visible. Even though not officially part of Benguet Province, Baguio City is within the borders of this province. Benguet benefits from the tourists who frequent the summer capital of the Philippines. Benguet has an agricultural economy with a high production of fruit and vegetables. If you come by the strawberries make sure you try some they are juicy and sweet! The Halsema Mountain Highway is also worthy of mentioning. I’m not sure if highway is the right word, perhaps goat track would be more suitable. The Halsema winds and twists its way through the mountains and gorges from Baguio City to Bontoc. It is reported to be the highest running stretch of road in the Philippines with an average altitude of 2,200 meters. In the middle of Benguet Province in the mountain city of Baguio. This city is not part of the province, even though it is right in the middle of Benguet, it is classified as independent. For all the information you need on Baguio City have a look here. You can either fly or go by road. Flying time from Manila to Baguio City, is only 35 minutes so if time is short catch a plane. Have a look here for information on flights and schedules to Baguio City. From Baguio you are in Benguet Province. The other option is to take an air conditioned bus from Manila, it will take about 6 hours. Ifugao Province is at the bottom of the Cordillera Mountain Range. To the north it shares a border with Mountain Province and to the south with Nueva Viscaya. To the east is the province of Isabela and Benguet Province lies to the west. Without a doubt tourists flock from far and wide to see the eighth wonder of the world, the Banaue Rice Terraces. Over 2,000 years old these manmade terraces are literally carved into the mountains of the Cordillera. Make sure you do not miss this amazing sight, it will definitely remain with you forever. Trekking and mountain biking are becoming more and more popular. There are numerous trails which are off the beaten track which have not had the tourist hordes frequenting. Beside the rice terraces, there are some great caves and waterfalls to explore. Take a plunge in the refreshing cool mountain water, there are quite a number of small swimming holes just waiting for you. Ifugao Province is just under 350 kilometres from Manila. You can catch a plane to the province of Nueva Viscaya, the land portion of the trip then will only take about 45 minutes to Ifugao Province. Buses from Manila ill take about 10 hours, the scenery is nothing short of awesome. Kalinga means headhunter in the Ibanag language, which is what they use to be. Fighting with neighboring tribes was all to common. Kalinga Province is on the eastern side of the Cordillera Administrative Region. It shares borders to the north with Apayao Province and to the south with Mountain Province. To the east is Cagayan Province and to the west is Abra Province. White water rafting down the Chico River is well worth the visit. The grades of the rapids vary but are generally in the class III and IV. The scenery is spectacular. White water rafting would have to be the best way to see the lush vegetation surrounding the Kalinga Province. There are some great vantage points to view the valleys and gorges with villages nestled on the mountains. The traditional nipa huts are frequent, providing a way of life changed little over time. Also lots of rice terraces. You can fly from Manila to Tuguegarao, which is the capital of Cagayan Province, have a look here for information. The flight and subsequent jeepney trip to Tabuk, the capital of Kalinga will take a little over 1 ½ hours. The other option is to bus it from Manila. Mountain Province is northern Luzon and is landlocked, like all the provinces in the Cordillera Administrative Region. To the north, Mountain Province shares borders with Kalinga, Apayao and Abra. The southern border is bounded by Benguet and Ifugao. The eastern boundary is shared with Isabela province whilst to the west is the province of Ilocos Sur. Like the other Cordillera Administrative Regions, rice terraces dominate the scenery. Cut out of the mountain side, looking like a stairway into the clouds. A visit to Mountain Province would not be complete without a visit to Sagada Caves. The caves around Sagada are highly accessible, be sure to enlist the help of a local guide. Some of the caves are actual burial sites, see if you can also get a look at the hanging coffins. Be sure to wear sturdy footwear as the surface can be messy at times. It would not be unusual to get quite wet whilst traipsing through the small underground creeks within the caves. A number of swimming holes are also popular for tourists, with the odd waterfall disappearing into gorges with lush vegetation overhanging the river. Time honored art of loom weaving is also alive and well in Sagada, Mountain Province. Here you will be able to purchase everything from bags to placemats in various colour arrangements. For the more energetic and adventurous, you can partake in trekking through the rugged mountains and gorges, mountain climbing any number of the 6 mountains waiting for your arrival or white water rafting in the Chico River. Getting to Bontoc in Mountain Province from Manila is a long bus trip. The trip will take you through Baguio City and then through the Halaema Mountain Highway to Bontoc. Once in Bontoc only jeepneys will take you the 4 hour trip to Sagada. Don’t be put off as it is well worth the effort.